The Saratoga Historical Foundation is hosting the Metro Gnomes barbershop quartet on March 26. The Metro Gnomes will take you on a journey through the world of close harmony to explain and demonstrate this art form, with wax-cylinder sound recordings, videos, and live performances. Learn how barbershop quartets helped to sell early phonographs, and of the nationwide radio broadcast of the 1939 New York barbershop singing contest. Hear how, through careful blending, four voices can sound like many times that number. The lecture will begin at 7:30 PM and take place at the Saratoga Foothill Club located at 20399 Park Place in Saratoga. The lecture is free for Saratoga Historical Foundation members and $5.00 for nonmembers. For more information go up to www.saratogahistory.com or call 408-867-4311-no reservation needed. Artist, Curator Bonnie Stone will give a short presentation on aprons "she has known and loved" on March 16 at l:00 PM at the Saratoga History Museum in Saratoga. Her presentation launches the exhibit, "Apron Strings and Vintage Things" which contains many aprons from her collection. The exhibit runs through April 28. The exhibit features over 60 colorful aprons dating from 1870 to the present. Aprons have been around for hundreds of years-worn by both men and women and in many professions. Enjoy light refreshments and come wearing your favorite apron. If you don't have an apron-choose one of the many available to purchase only on March 16 as a fundraiser for the museum. Stop by the museum at 20450 Saratoga-Los Gatos Road to see the display and hear the presentation. The museum is open from 1-4 PM Friday, 10-4 PM on Saturday and 1-4 PM on Sunday. Admission is free. Antique cars, art, crafts, live music and more will be part of the Seventh Annual Blossom Festival held April 13 from 10-4 PM at the Heritage Orchard and Saratoga Civic Center (13777 Fruitvale Avenue in Saratoga, CA). The event is free and open to the public. Activities include a wide range of live music, entertainment, paintings, Saratoga historical characters, artists, local organizations and artisans. Gourmet food trucks will also be part of the fun. Lots of things to do from children including activity tables, petting zoo, and more. The Girl Scouts are handing out flowers to visitors commemorating the historic festival. First produced in 1900, this historic event ran successfully for 41 years. Come help celebrate this tradition. It is produced by the Saratoga Historical Foundation and sponsored by the City of Saratoga. For more information: call 408-867-4311 or www.saratogahistory.com. Free parking and free admission. A new exhibit, "Apron Strings and Vintage Things" will open at the Saratoga History museum on January 11 and run through April 28. The exhibit features over 60 colorful aprons dating from 1870 to the present. Aprons have been around for hundreds of years-worn by both men and women. Stop by the museum at 20450 Saratoga-Los Gatos Road to see the display. The museum is open from 1-4 PM Friday, 10-4 PM on Saturday and 1-4 PM on Sunday. Admission is free. The Museum Gift Shop has "For the Love of Apricots" a new cookbook feature recipes using fresh and dried apricots. Purchase one for yourself or for a gift. The full color cookbook by Lisa Newman is packed with recipes and reminisces about growing up in Saratoga. Stop by and buy a copy! Take a walking tour of the Saratoga Village. This docent-led tour takes about 1 to 1 and ½ hours. Find out about the history of your community. To make a reservation, call 408-867-4311. Docent-led tours cost $3.00 per person. The recorded sounds of a blacksmith forge might ring in the hills as the Saratoga Historical Foundation raises funds to convert an existing outside area into an interactive blacksmith exhibit. The blacksmith exhibit ties into the nearby 1850's McWilliams House because the owner, James McWilliams was Saratoga's second blacksmith. 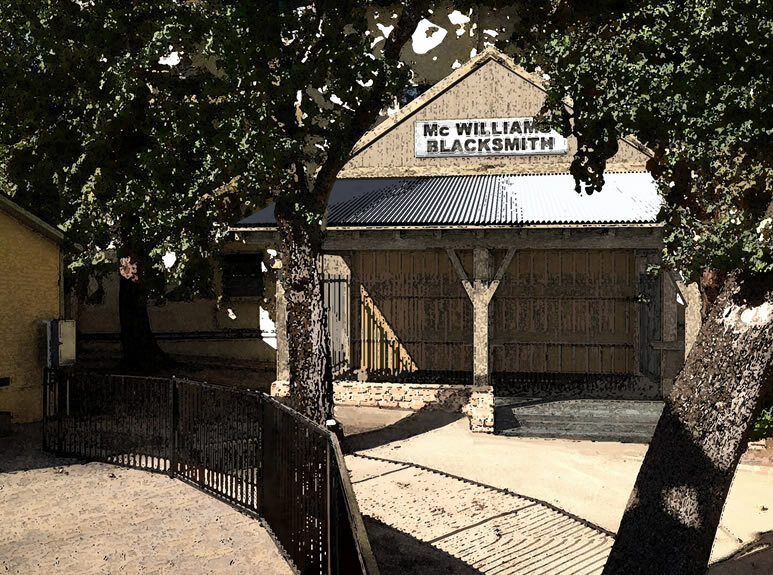 The blacksmith exhibit will house tools and items normally worked on by a blacksmith. Some interactivity and possibly sound effects will be available. Also planned is a nonfunctional outhouse—as part of the turn of the century theme of all the structures in the Saratoga Historical Park. All the structures—McWilliams House, one-room schoolhouse, museum, and soon the blacksmith exhibit are used to teach pioneer living as well as Saratoga's rich history. If you would like to contribute to this exhibit ($5000 contribution and higher will be part of a plaque on the outside of the exhibit), please send your contribution to: Blacksmith Exhibit, c/o Saratoga Historical Foundation, PO Box 172, Saratoga, CA 95071. Your donation is tax deductible. Jan 11 through Apr 28 Exhibit - "Apron Strings and Vintage Things"
March 16 1:00PM Lecture - "Apron Strings and Vintage Things"
Tell Us About Your Saratoga! The Saratoga Historical Foundation collects memories and information about Saratoga places, people and more. Please complete the form HERE and help us add to our records! Thank you. Some Free Things To Do! Get in touch with local history by taking our historic landmark walking tour, bicycling the historic house tour, and walking around our historic garden with a self-guided tour. Get out your camera and your walking shoes! The Saratoga Historical Foundation offers docent-led walking tours or you can download the tour and take a self-guided one. The docent-led tours last about 60 minutes with lots of easy walking. Meet your fellow “time travellers” and get some exercise at the same time. Make an appointment today by calling 408-867-4311 and take advantage of this opportunity to learn more about the history of your community. Forget about driving and bicycle our historic house tour. See over 30 heritage homes on this self-guided bicycle tour. Want just a little exercise? Walk the historic garden in the Saratoga Historical Park—a copy of the self-guided tour is available outside near the Museum door or by downloading. The plants look different with each season so there is reason to return again and again. Find out how Native American children used ferns. The walking tour, historic house bicycle tour, and the garden tour maps can be downloaded from this site. Saratoga High School students looking to fulfill community service requirements can contact Linda Hagelin at the Saratoga History Museum. Please e-mail HERE with the date you can work. The museum is open Friday and Sunday from 1-4PM, Saturday from 10PM to 4PM. 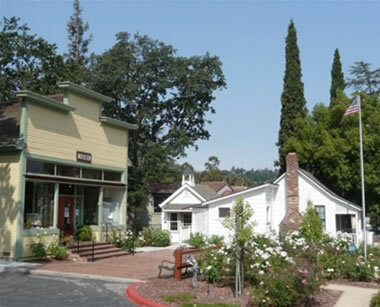 Saratoga: A Lumber Town, traces the history of Saratoga from the Ohlone’s to the present historic village. The excitement of the once rollicking lumber town to the battle for incorporation is of interest to every Saratogan. The Interurban Railway, yearn for the days of a trip by rail to San Jose or Palo Alto on the sleek Interurban Railway? The mass transit train, carrying packages and people, once quietly traveled the Santa Clara Valley. Prohibition—sit back and enjoy hearing about the driest town in the valley – a period of time that lasted over 40 years. Interesting stories about the effect of Prohibition on the local wineries (including Paul Masson) will make you smile. Lincoln’s Funeral Train- miracles and sadness travelled with the death of Present Abraham Lincoln as his funeral train made it’s last journey. Flying Tigers – find out more about these intrepid Americans who fought an air war prior to WWII for freedom in China. The presentations are appropriate for groups of all ages. Cosyn has given presentations to those interested in the Civil War, railroads, winemakers, high schools, as well as local history and other organizations. If you are interested in having Cosyn speak before your organization, you can contact him HERE. More information on lectures HERE. We've just added the new, "For the Love of Apricots" cookbook to the gift shop. Perfect as a gift or for you! This locally-written cookbook combines memories of the Valley of Heart's Delight plus tasty recipes. The gift shop also has many books on local history, postcards, notecards and more. The gift shop is open Friday and Sunday from 1-4 PM and on Saturdays from 10AM-4PM. The Saratoga Historical Foundation is now on the AmazonSmile list. Visit www.amazonsmile.com when you want to purchase an item and select the Saratoga Historical Foundation, by doing so, .5% of your purchase will be donated to the Saratoga Historical Foundation. No extra cost to you-- it is part of a program initiated by Amazon to give back to the community.